What are Gaylord Boxes? - National Box Exchange Inc. When I tell people I sell Gaylord boxes, many people say to me “what is that”? If you have not worked in a warehouse, in the shipping industry, in manufacturing, or at a recycling yard you probably have not heard of a Gaylord box. A Gaylord box, also known as a bulk box, bulk bin, skid box, pallet box, Octabin, PM80, and more recent a HPT 41, is a large bulk box that sits on a pallet and is used for storage and shipping of bulk quantities. Originally manufactured by the Gaylord Container Company of St Louis. The term “Gaylord” has become the generic name for any large palletized box. 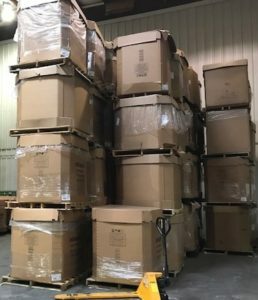 Gaylord’s have changed and evolved over the years to many different sizes and shapes but everyone in the shipping, recycling, and manufacturing industries still calls this palletized box a Gaylord box. How are Gaylord Boxes Made? Gaylord boxes are made of corrugated cardboard from brown Kraft paper. This material is lightweight, stiff but strong and resists bursting, splitting and tearing. A sheet of cardboard is made out of three pieces of Kraft paper. 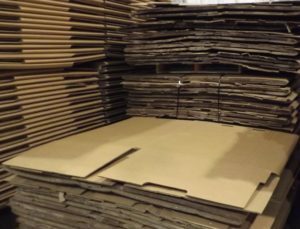 During the production process, one piece is crimped and glued between two other pieces to form corrugated cardboard. Gaylord’s usually have many layers glued together, depending on the wall thickness needed. When completed the cardboard is cut and folded to make boxes. The boxes are durable and impact and tear resistant. They can hold large amount of weight stacked on top of them and most Gaylord’s today are double wall to six walls in thickness. You will find some have top and bottom flaps like a traditional packaging box, many have open tops, some are rectangle, some are square, some are octagon in shape, some have full bottoms, some have slips sheet bottoms, and some have no bottoms. Some have holes in them to let fruits and vegetables breath, and some have spouts if they are holding liquid. It doesn’t matter the size and shape, they are all still known as Gaylord boxes. Gaylord boxes are used by many manufacturers, shipping companies, wholesalers, and recyclers. They are used for shipping and storage of bulk materials. Some of these heavy-duty boxes can hold as much as 3000 lbs. They are used in the recycling industry to hold and ship scrap metal, electronic recycling, plastic scrap, rubber, waste paper and demolition materials. They are used by food manufacturers for the shipping and storage of their powder ingredients like sugar, salt, flour, and milk powder. Other food manufacturers will use them to hold grains, oats, pasta, cereal, bread crumbs, herbs, spices, and fruits and vegetables. Just about anything you put in these boxes will be contained. They can be stacked in a trailer or in the warehouse. Some warehouses you will see them stacked full of material 4 high. Gaylord’s are sometimes used several times before they are recycled. They can be folded and stacked neatly and stored in a warehouse or trailer.